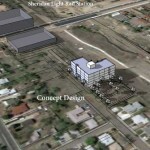 ULC purchased 11th Avenue TOD in July of 2012 using Denver’s Transit-Oriented Development (TOD) Fund. The $24 million TOD Fund supported the creation and preservation of over 600 units of affordable housing to date, therefore leveraging over $500 million in local economic activity. The three acre piece of vacant land sits east of Sheridan boulevard and next to ULC’s Sheridan II property. The land is in Denver, adjacent to the Lakewood border. 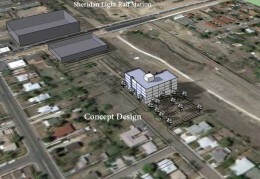 The site sits next to the RTD Sheridan Light Rail Station, servicing the West Line. Sheridan boulevard sits directly above the rail station. At the present time, 11th Avenue TOD is in the land banking stage, meaning ULC is holding the land for future development plans. We have not yet announced a development partner. In due time, future transit oriented development will include affordable housing and mixed-income development. ULC is assessing the possibility of including a home-ownership aspect such as condos or town homes, due to the added affordability. Last week ULC celebrated independence day with a new property acquisition. The 11th Avenue TOD was purchased for $350,000 using Denver’s Transit-Oriented Development Fund. The .83 acre property is located less than 1/4 mile from the future Sheridan Station on the West Line corridor of FasTracks and will be developed into 58 affordable senior homes.